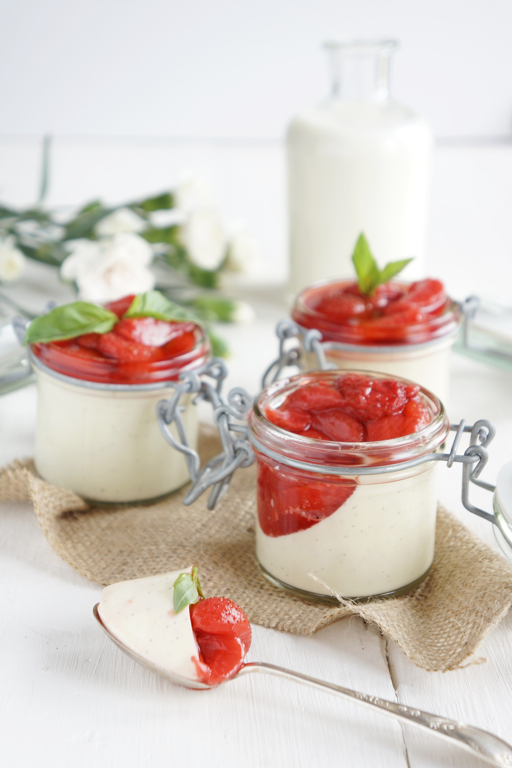 This ‘Basil Panna Cotta & Strawberries in Prosecco Syrup’ is simply going to blow you away! A combination of basil (symbol of love for the Italians…isn’t everything? 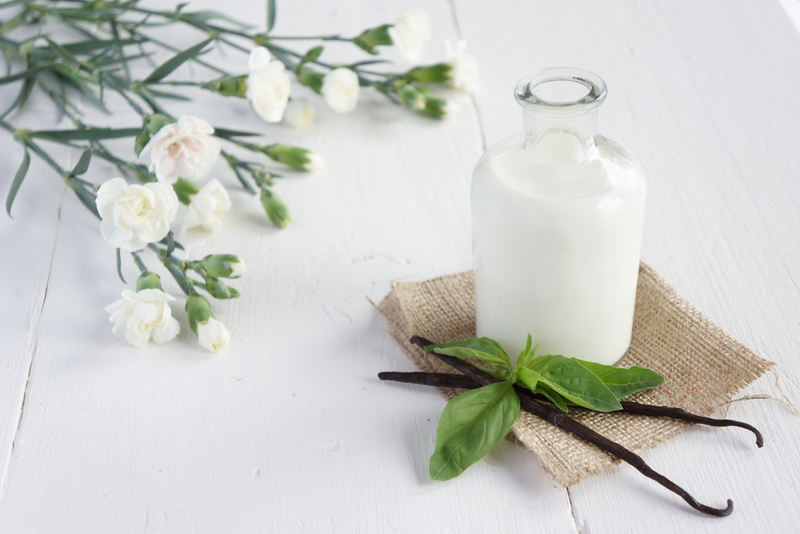 ), vanilla (natural aphrodisiac…isn’t everything?) and strawberries (the venus of the fruits…more food-centric lust) delivers irresistible pleasure – the perfect conclusion to the food bit of a date! Let me persuade you otherwise! 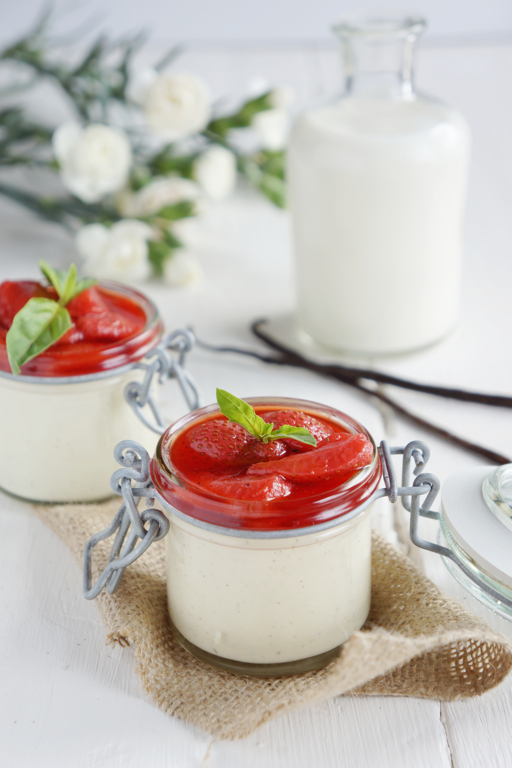 Panna cotta – cooked cream – requires nothing more than heating up some cream, adding gelatine and leaving it to set. Just add a coulis of fruits and serve. I guarantee that it will become a dinner party favourite, as it is very simple to make, you can prepare it in advance and you will have a copper-bottomed crowd pleaser on your hands! You can also use it again and again as it is infinitely variable: sweeten it with agave or maple syrup; make it dairy free by using almond milk or coconut cream; add any sauce you fancy. As long as you have the right ratio of liquid so that it sets, you can let your imagination run wild. I still remember staggering up to a dessert buffet with an over-filled belly as a small kid, seeing neat rows of little cups filled with precious, smooth-looking promises of sugary happiness… I just had to try one! It wasn’t until this year that I considered taking on panna cotta at home, as it seemed intimidating somehow. When I eventually accepted the challenge I found, to my surprise, that it requires few ingredients, even less effort and that the flavours are as intoxicating as that first encounter. Start with the panna cotta. Soak the gelatine leaves in a bowl of cold water for 5min. In the meantime, pour the cream, milk, sugar and basil in a saucepan. Halve the vanilla pod, scrape the seeds into the saucepan along with the pod. Gently heat up the cream until hot but not bubbling! Take the gelatine, squeeze out any excess. Add one by one to the cream, stir until dissolved. Take the hot cream from the stove and let it rest for 30min. Strain the cream through a sieve into 4 glasses. Put into the fridge for at least 3 hours or overnight. Pour the Prosecco into a saucepan, heat until reduced by half (3-5min). Add the sugar and strawberries. Scrap the seeds of the vanilla pod, add to the pan along with the pod. Heat gently until the strawberries are softened (5-10min). Allow to cool. Before serving, take out the panna cotta. Dress each with a few spoons of strawberries and syrup, decorate with a basil leave (optional). Make a bigger quantity of the strawberry syrup and add it to your Prosecco for an aperitif. Your guests will be delighted! For a more luxurious variation, use Champagne instead of Prosecco. Prepare the panna cotta the day before or in the morning. Exchange the gelatine with agar flakes or similar to make it suitable for vegetarians. 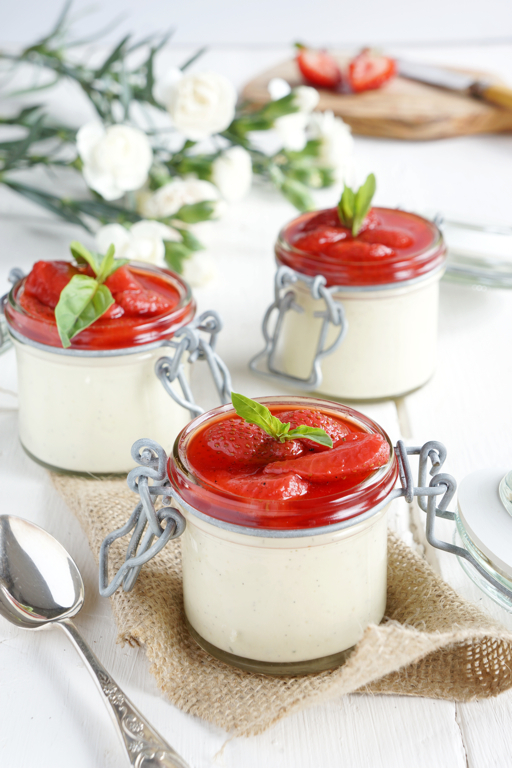 Instead of sugar, use agave or maple syrup to sweeten the panna cotta. Use other fruits for the Prosecco syrup such as peaches, apricots or blackcurrant. This entry was posted in Food, Food Photography, Food Styling, Recipes and tagged dessert, photography by Françoise La Prune. Bookmark the permalink.